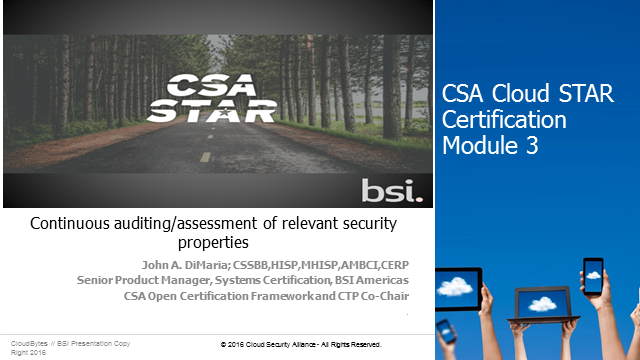 While the Cloud Security Alliance’s (CSA) STAR Certification has certainly raised the bar for cloud providers, any audit is still a snapshot of a point in time. What goes on between audits can still be a blind spot. To provide greater visibility, the CSA developed the Cloud Trust Protocol (CTP), an industry initiative which will enable real time monitoring of a CSP’s security properties, as well as providing continuous transparency of services and comparability between services on core security properties. This process is now being contributed to by BSI and other industry leaders. CTP forms part of the Governance, Risk, and Compliance stack and the Open Certification Framework as the continuous monitoring component, complementing point-in-time assessments provided by STAR certification and STAR attestation. The concepts behind different evolving approaches to continuous monitoring, the next step in increasing transparency in the cloud.